My study zone is in the middle of two geologic maps with two different shp files. Is it possible to remove the boundaries of the polygons between these two maps that are created at the union of these in order to have only one polygon (per geologic unit)?. In other words: to obtain an "unpartitioned" map (in QGIS). Use Dissolve tool from Vector -> Geoprocessing -> Dissolve and choose the field that has the geologic name or id, the one you are using to style the polygons. If the line did not disappear, zoom in into the line and check if there is a gap between the polygons. If you want more control over the attributes of the merged feature than the Dissolve tool allows, use the Merge Selected Features tool in the Advanced Digitizing toolbar. Obviously the downside of this tool is that you have to do each set of features separately, so it can be time-consuming if you have a lot of features. You can achieve a similar level of control over the attributes by first Dissolving, then running join attributes by location (summary). Not the answer you're looking for? 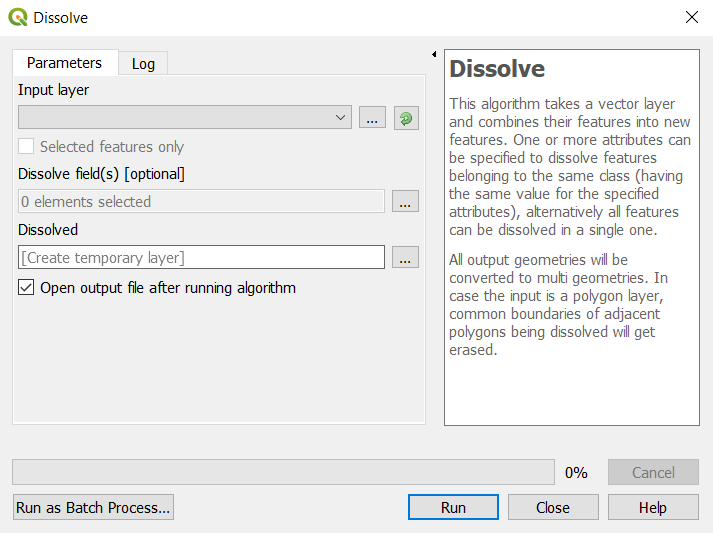 Browse other questions tagged qgis polygon vector partition or ask your own question. Given two polygons, find the the one with more detailed/accurate shoreline? Can QGIS create Vector Polygons from Raster Data?